Thomas Wright ?Fats? Waller (1904?1943) was an American jazz pianist, organist, composer, and comic entertainer. He was born Thomas Wright Waller on 21st May 1904 in New York City, New York, United States to a Baptist minister father. The Waller family migrated to Harlem from Virginia. Fats' grandfather, Adolph Waller, was an accomplished violinist. Waller started his musical career at an early age. He was born Thomas Wright Waller on 21st May 1904 in New York City, New York, United States to a Baptist minister father. The Waller family migrated to Harlem from Virginia. Fats' grandfather, Adolph Waller, was an accomplished violinist. Waller started his musical career at an early age. He studied classical piano and organ as a child, taught largely by the music director of his Baptist church, who insisted he also learn the organ works of J.S. Bach. As a young adult, Waller took regular piano lessons from legendary Harlem stride pianist James P. Johnson. He also benefited from legendary stride pianist Willie "The Lion" Smith, who gave Fats the nickname "Filthy". Johnson introduced Waller to the world of rent parties (a party with a piano player, designed to help pay the rent by charging the guests), and soon he developed a performing career; thus, making his first recording in October 1922 when he was just 18 years old. He was an excellent pianist ? now usually considered one of the very best who ever played in the stride style. Before his solo career, he played with many performers, from Erskine Tate to Bessie Smith, but his greatest success came with his own five- or six-piece combo, Fats Waller and his Rhythm. 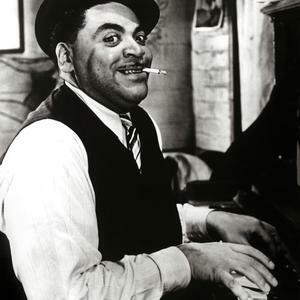 Fats Waller was such an impressive and talented pianist that he came to the attention of the rich and famous - sometimes whether he wanted to or not. Fats Waller was in Chicago in 1926 and, upon leaving the building where he was performing, Waller was kidnapped by four men, who bundled him into a car and drove off. The car later pulled up outside the Hawthorne Inn, owned by infamous gangster Al Capone. Fats was ordered inside the building, to find a party in full swing. With a gun against his back, Waller was pushed towards a piano, whereupon the gangsters demanded he start playing. A terrified Waller suddenly realised he was the "surprise guest" at Al Capone's birthday party. Soon comforted by the fact that he wouldn't die, Waller played, according to rumor, for three days. When he left the Hawthorne Inn, he was very drunk, extremely tired, and had earned thousands of dollars in cash given to him by Capone himself and by party-goers as tips. Among his songs are "Squeeze Me" 1919, "Keepin' Out of Mischief Now", "Ain't Misbehavin'" 1929, "Blue Turning Grey Over You" 1930, "Honeysuckle Rose" 1929, piano cutting piece, "Handful of Keys", "I've Got a Feeling I'm Falling" 1929, and "Jitterbug Waltz" 1942. He collaborated with the Tin Pan Alley lyricist Andy Razaf and had a commercially successful career, which according to some music critics eclipsed his great musical talent. His nickname came about because he weighed over twenty-one stones. His weight and drinking are believed to have contributed to his death. Waller also made a successful tour of the British Isles in the late 1930s, and appeared in one of the earliest BBC Television broadcasts. While in Britain, Waller also recorded a number of songs for EMI on their Compton Theatre organ located in their Studios in St John's Wood, London. He also appeared in several feature films and short subject films, most notably Stormy Weather in 1943, which was released only months before his death. On 15th December 1943, at the age of thirty-nine, Waller died of pneumonia aboard an eastbound train in the vicinity of Kansas City, Missouri, following a west coast engagement.